The winding coastal road to the west of Sorrento sweeps along hilly slopes of olive and lemon groves, villages keeping the charm of bygone times, fishing villages and captivating views of the scenery. Massa Lubrense is the first stop on the way departing from Sorrento. It is composed of 14 hamlets which are connected by paths and mule tracks, buses or cars driving along a network of roads linking them. 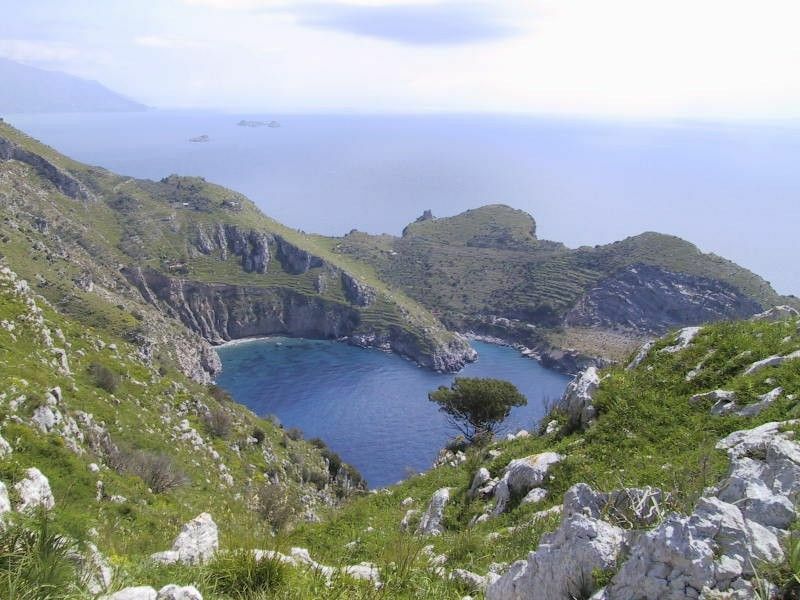 Its centre, Largo Vescovado, enjoys a magnificent vista of the island of Capri. On the same thoroughfare is Chiesa di Santa Maria della Grazia, constructed in the 16th century and which was Massa Lubrense’s cathedral centuries ago. Check out its beautiful majolica flooring. On foot you can go down to Marina della Lobra. The walk down is easier than the ascent (20 and 40 minutes respectively). The picturesque seashore features some houses which seem to be fallen down and green hill slopes. As you descend you will find the 16th century Chiesa di Santa Maria della Lobra. The village is perfect to hire a boat and row to the bays and inlets on the coast which are unreachable in other ways. You can have a boat at Coop Marina della Lobra. Funiculi Funicular is on Via Fontanelle in Marina della Lobra. It serves delectable pasta, great seafood and grilled meat in generous portions. Hotel Ristorante Primavera on Via IV Novembre has a well lighted terrace restaurant . BY CAR: from Sorrento go along Via Capo as far as Piazza Vescovardo.